Okay, maybe we’re being a little dramatic. But, this week was a bloodbath for the cryptocurrency market. 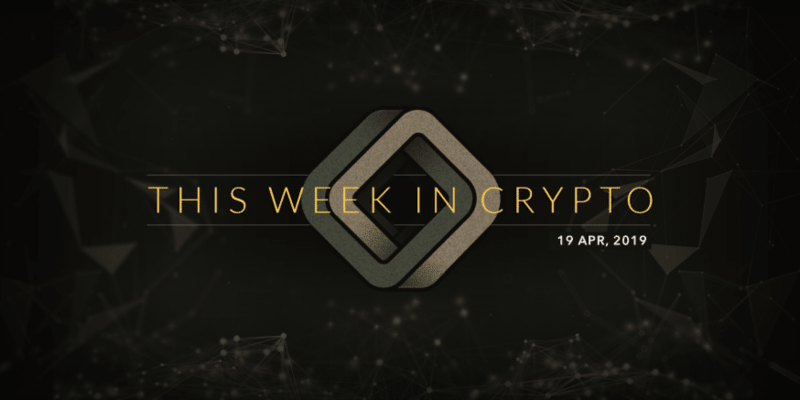 For the first half of the week, the market seemed to be continuing the non-volatile movement we’ve gotten accustomed to over the last few weeks. However, on Wednesday, things turned south with an almost immediate seven percent drop in the market cap. Several events may have contributed to this steep dropoff, but the infighting and subsequent hard fork of Bitcoin Cash certainly didn’t help. Since this time last week, the entire cryptocurrency market fell just over 13 percent, currently resting at about $184B. A drop like that makes us hesitant to check in on the top coins. Bitcoin fell to 2018 lows this week, losing 12.24% of its value. XRP jumped over Ethereum in the rankings but still dipped 5.83%. Ethereum took a heavy tumble as well. A 15.43% tumble, to be exact. It’s worth noting that the Bitcoin Cash drama has greatly affected the price, with the Bitcoin fork falling 28.88% this week. Microsoft Combines SDK with DLT: Yesterday, Microsoft released a blockchain development kit (BDK?) as part of the Azure Blockchain Workbench platform. The company intends for the blockchain SDK (we like BDK better…) to help businesses quickly integrate distributed ledger technology (DLT) into their existing systems and workflows. The initial release includes capabilities such as connecting interfaces like mobile devices and IoT, integrating data that resides off-chain, and executing smart contracts. Microsoft plans to continue to expand the BDKs offerings as additional use-cases come to light. Trump’s Acting Attorney General has Strange Crypto Ties: And we’re not talking about the ones you wear around your neck. President Trump’s temporary Attorney General, Matthew Whitaker, has a colored history, to say the least. Whitaker previously sat on the advisory board of World Patent Marketing, a firm most notably known for being shut down by order of a federal judge. Coinsource on its Coveted NYC BitLicense, Bitcoin ATM Fees, and Crypto Regulations: The Coinsource team shares what it takes to get the elusive BitLicense. Bakkt: A Global Ecosystem for Regulated Digital Assets: (*Arnold Schwarzenegger voice*) I’ll be Bakkkkkt. The Ultimate Privacy Coin: Monero or Zcash? : See which of the two top privacy coins will keep your transactions under wraps. A Crypto Wallet Company Is Giving Away Digital Currency Worth $125 Million: Get yourself a slice of this sweet Stellar pie. Glossary of Key Cryptocurrency Technical Analysis Terms You Need to Know: We’ve got you covered with everything from averages to VPOCs. What is Merged Mining? Can You Mine Two Cryptos at the Same Time? : Well, can you? Can you?? The answer is yes. All You Need to Know About Perianne Boring: We can confidently say that her last time does not define her life. Fibonacci Retracements: Forecasting High-Probability Reversals in Cryptos: I’ve heard a lot of terrible math jokes in my time, but this Fibonacci joke is as bad as the last two combined. Bitcoin Mining Trumps Gold Mining Energy Consumption Estimates: Allegedly. Power Mining Pool | What a Crypto Mining Scam Looks Like: We break down a classic scam, so you won’t get fooled again. No no no. Changelly vs. ShapeShift | Head-On Review: Looking to quickly exchange some cheap, hot alts? These platforms are for you. Privacy Coin Runner-Ups: Bytecoin, PIVX, Verge, and Dash: These coins may not be as good as the top two, but they’re still worth your attention. Why Crypto Investors Should Care About Private Blockchains: You may have thought you could just write off private blockchains. Here’s why you may be wrong. Can I Buy Bitcoin with My IRA? : Take hodling to the next level by adding Bitcoin to your IRA portfolio. Did we mention the additional tax breaks you get with it? HitBTC Review: Is HitBTC Safe to Use? : Find out if the high liquidity exchange is right for you. A Beginners Guide to Privacy Coin Mining | How to Mine ZCash: You already know it’s one of the top privacy coins. Now, you can mine some for yourself. Oxfam Blockchain Helps Cambodian Farmers: On Thursday, Oxfam officially launched BlocRice, a blockchain-based solution giving farmers more bargaining power when dealing with buyers. The platform provides smart contracts between Cambodian rice farmers, Cambodian exporters, and Dutch buyers. BlocRice started as a pilot program last April and is set to expand in March 2019. Oxfam hopes to reach beyond the Cambodian rice industry into other countries as well as other verticals. Tokyo Police Bust Cryptocurrency Pyramid Scheme: Another day, another crypto scam. This time, eight people were arrested for their involvement in a pyramid scheme that cheated thousands of people out of nearly $70 million dollars. The crew convinced several people to give them money to buy Bitcoin on their behalf, claiming up to 20 percent monthly returns. They also promised additional investment returns if current investors referred new people. Six of the eight accused have already admitted guilt.